Hillary is the candidate of choice for the establishment and directly on the payroll of big-business lobby interests. Trump, although not at true populist, is still an outsider candidate, mostly self-funded and feared by the establishment. A Hillary victory rewards and justifies election rigging, no correction for the Democratic party. Clinton’s re-election campaign. Hillary is an 8 year commitment that will be up for re-election in 2020 against yet another Republican. A Trump presidency makes 2020 another chance to elect a better Democrat than Hillary. The entire House of Representatives and 33/100 Senate seats are up for re-election in 2018. Hillary guarantees they stay Republican just like under Obama. ‘Sanders Democrats’ running for office have a better chance to rise during a Trump presidency than Hillary. Trump forces the Democratic party to become more progressive more quickly. Trump is to the left of Hillary on foreign policy. Hillary, a bigger war hawk than Trump, is the candidate of choice for the military industrial complex. Clinton’s record on foreign policy is not a good one. Trump is to the left of Hillary on trade and has always been against destructive trade deals like TPP. Hillary called TPP the “gold standard” and has supported every trade deal since NAFTA. Trump has repeatedly said he won’t touch Social Security. If truthful, he is a welcome leftward push for the Republican party. Hillary is another Obama, and Obama tried to cut Social Security using the Chained-CPI under the guise of it being merely an adjustment. “They should have run Sanders, they lost because of Clinton.” -vs- “America just isn’t ready for Sanders Socialism.. Hillary was the pragmatic, correct choice.” We want people to think the former, not the latter. A Hillary win means the progressive vote will continue to be taken for granted. Bernie or Bust support will be laughed at if Hillary wins. If Trump loses to Clinton, the Republicans go back to being the party of George W. Bush and Mitt Romney. The populist uprising will be defeated on both sides of the aisle by establishment hero Hillary Clinton. A Clinton loss means an end to the Clinton/Bush era. President Hillary Clinton will spend the next 8 years marginalizing and purging anything to do with Bernie Sanders from the party, as the DNC survives under her leadership. A Trump victory means the Democratic party becomes progressive fast, or dies. Lets look at language in politics and media. Language that filters into everyday conversation and thought – thought influenced by the thinking behind the language. Language can become a powerful tool when you’re trying to brainwash the citizenry. We’ve seen this laid out systematically in Orwell’s 1984. When you’re doing something sinister, use opposite meanings. The Ministries of Truth, Peace, Love and Plenty were actually ministries of lies, war, torture and austerity. Orwell called this doublethink. In the real world, we’ve seen words attacked over time in coordinated effort and great effect. The word “liberal” has become a dirty word. So successfully, that it nearly has the venom of a racial slur. The embarassment of being called a liberal developed over a 30+ year period of sustained attack. Perhaps the most sinister language assasination is the demonization of “socialism.” This distortion becomes subtle due to different kinds of socialism, which become important when you see the foodstamp program equated to Communism. Socialism is an essential part of any organized society. We all depend on one another, and nobody more so than the very wealthy. Corporations don’t exist on desert islands (unless a tax haven.) The wealth of the .01% is entirely dependant on large numbers of people – that is, dependant on socialism. Without all of us, they are left as Thurston Howell III. The demonization of socialism is being directly used to push an extremist agenda, by those who have another form of socialism in mind. Another twisted word is “reform.” The very people who want to destroy public programs talk about wanting to reform them. A reformer has the best interest of a program at heart, these “reformers” are looking to bring a wrecking ball. The contrast is everything. 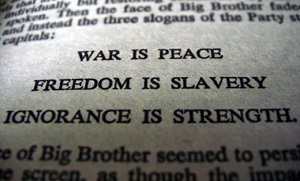 Now, how about if we re-reversed doublethink, and somehow the truth crept out from the shadows. What if the media and politicians just spoke the straight-forward honest truth? What would that look like? How about, instead of the term “liberal” being used to describe Obama, Hillary and the democratic establishment, they used the term “neoliberal.” This would be truthful instead of dead wrong. Neoliberalism being a far right-wing ideology. How about instead of calling republicans “conservatives” they were called “corporatists.” Its what they really are, and there’s nothing conservative about the republican corporatist agenda. So we have the neoliberals versus the corporatists (no tangible difference really) battling-it-out over who’s donors get the bigger piece of our pie. Sounds pretty grim, but at least it more accurately describes our current political reality. Its time we demand our media speak the truth, and reflect that in actual language. If they don’t they need to be replaced with media and politicians that do. Language and media are effectively used to mask the truth of our time, and this is a crime.